These fleece-lined boots have the added warmth and comfort of a fleece lining. Perfect for cold temperatures and snow. But I like them best for muddy days in the backyard. No more muddy paw prints on hardwood floors and carpets! 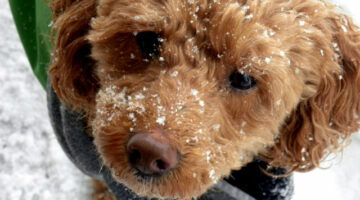 The best tips for keeping your dog safe during the colder winter months. These are some safety precautions that every dog owner should be aware of. Dog Neutered Twice… Now THAT Takes A Lot Of Balls! What follows is the somewhat interesting… somewhat comical… and somewhat informative story of Destin’s anything-but-routine neutering. Or, what we like to call ‘Destin’s Double Ballsectomy’.